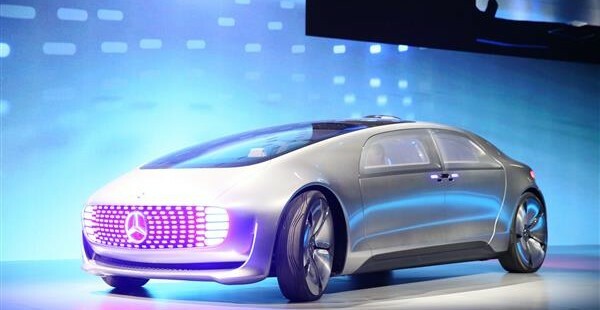 The future may finally be on the horizon with Mercedes previewing the incredibly futuristic F 015 Luxury in Motion - an autonomous vehicle that has been heralded as the pinnacle of engineering, and one that has the potential to reshape the landscape of motoring for years to come. The F 015 looks simply inspiring, and it's not hard to see where it's lofty predictions are coming from. With a streamlined and un-imposing exterior design that is characterized by its flat front windscreen that lavishly joins the roof and LED light modules which in their position at the front and back are designed to provide ''a variety of innovative lighting functions''. The vehicle is set to be one of the few vehicles on the future market that is both electric and autonomous. With these two unique selling points, it is unsurprising the vehicle was revealed at the Consumer Electronics Show or (CES) in Las Vegas rather than the series of Auto Show's that surround the beginning of the year. Technology is being championed by Mercedes and the vehicle could well blow it's traditonal rival BMW and it's i3 and i8 out of the water, in terms of high-tech features and economy. Using a fuel-cell hybrid powertrain that drives the F 015 across 684 miles without producing a single emission - the vehicle employs fuel cell-derived electricity for 560 of this and battery power for 124. Of course, much of this forms the blueprints and none of this set in stone. Mercedes are expected to turn the tables on the motoring ''status-quo'' and have marked the vehicles previewing with the mission statement to ''reinvent the car''. From the initial impressions, it could very well do that. The stand-out feature of the interior is the fact it's cabin is not dissimilar to a modern lounge. Dubbed the ''digital arena'' the new-features available will be seemingly un-ending. With swivel-seats that can be turned to face each-other the F 015'sinterior design means you can liase with clients or chat with friends in a luxurious and cavernous layout that will be accomodating for a variety of purposes. The interior looks both futuristic and revolutionary and passengers will have the option to begin controlling the vehicle at any time they see fit with the introduction of a steering looking more of a ''just in case'' job from Mercedes. The seats will welcome you upon your entrance by rotating 30 degress to create greater ease of entry. There will also be six high-res displays in various places to allow passengers to take views of the road as, and when they see fit. A combination of carbon-fibre materials make up the interior and the vehicle is similar size to the popular S-Class model line. Mercedes has also referred to it's trademark technology features such as PARKTRONIC, DISTRONIC PLUS and Steering Assist as evidence for it's galvanizing of the new market. These features are available in current Mercedes models, all of which are available for a competitive, fully-comprehensive quote that comes with no-obligations and the ability for all orders and vehicle enquiries to be tailored to personal requirements. Our sales advisers are friendly, professional and highly experienced and knowledgeable in the industry and all current Mercedes Lease deals. They will always endeavour to find the correct deal for you and will guide you through a smooth process. Don't hesitate to get in touch, visit: Mercedes Business Lease or email: info@selectcontracts.co.uk or call: 0845 6770 770.